Growing up on "Skyline", I'd often hear my dad telling stories about the great times "the boys" had on Saturday nights at the local dances. Grange halls, schools, and barns were all potential sites. Within walking and riding distance for the locals were Mason Hill, Dixie Mountain, Munson Hill, Brooks Hill and Helvetia. Families with younger children also attended, laying a blanket in the corner for the young ones to sleep. One of Dad's stories described a rainy, winter evening ride to the Folkenberg School on Cornelius Pass Road. As they neared the railroad tunnel, the mud on the road was up to the horse's girth. In a few more minutes, both horse and rider were sliding into the canyon. Checking his horse, Babe, for broken bones, he managed to lead her over fallen trees and rocks back to the road. When I commented that he must have been grateful that they both had survived the fall but disappointed to miss the dance, he said, "Oh, no I just went on to the dance, mud and all!" Just after WWII, some new neighbors, Ben and Babe Olson, moved to the farm next to us (the barn is adjacent to the entrance of the Skyline Ridge development). We were happy that there were also two children, Ron and Karen, Who were the same age as my sister Karen and I. Being new to Skyline and rural life, the Olsons decided to create a livelihood from the big barn on the property. Ben and his uncle, Alex Linden (owner of Plainview Grocery), used their carpentry skills to alter the interior from horse and cow stalls and hayloft into a shining hardwood dance floor complete with band and refreshment stand. The Skyline Barn Dance was the newest addition to Skyline's dance halls. Every Saturday night, patrons traveled from St Helens, Scappoose, Vancouver and Hillsboro as well as many locals from the hill to dance to a Western "swing" band. More than just western music brought dancers to the Barn Dance. A good portion of the evening included polkas, schottisches, and an occasional "Paul Jones", a circle dance. When the dancers got hungry, Babe's famous ham sandwiches sold quickly. These were homemade from Swedish rye bread recipe of Ben's mother. And dancers get thirsty. Without a liquor license, people made frequent trips to their cars for liquid refreshments. When bottles started flying in the parking lot, Ben soon became the designated "bouncer" with regular backup from the Multnomah County Sheriffs. Due in large part to Babe's sandwiches, the green sheriffs car usually arrived before the dancers. As a child, I remember listening to the music from our house on Saturday night. Sometimes we would spend the night at the Olson's and come to the dance for an hour (before intermission I). It was fun to dance the polka and round dances as well as eat a sandwich. In the morning we would help polish the dance floor by sliding on towels with dance wax. We didn't mind helping to clear the parking lot of bottles as we might even find a dollar bill that someone dropped. 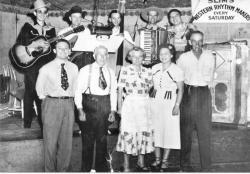 The Barn Dance continued until the early 1960"s. Many of my parent's generation remember New Years Eve at the Barn Dance. Many of my generation remember leaving our high school dances (unknown to our parents) to come to the Barn Dance. My mother was invited and worked for about a month as a cashier there, until Dad decided that was not where she should be on Saturday night. Now the barn has deteriorated and will probably be gutted, either by the next windstorm or a new owner. Many of the magnificent barns of the turn of the century are gone. But many of us who grew up on Skyline still have memories of good neighbors, swing bands, polkas, and ham sandwiches.